La Riva lies on a waterway at the northern end of Lake Como. It is surrounded by mountains, close to the nature reserve of Pian di Spagna and within walking distance of Sorico, a pretty town with bars, restaurants and shops. The site is beautifully laid out, with 70 level touring pitches on well tended grass, and an average size of 80 sq.m. Many have attractive views across the river to the mountains and most have 6A electrical connections. Reception houses a small bar, with limited snack bar and takeaway. Bread and milk to order. The excellent outdoor pool has a sunbathing terrace. 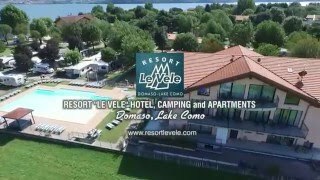 Camping La Riva has a happy, friendly atmosphere. This is a small, quiet site which enjoys direct access to the water and is well located for trekking in the surrounding mountains or for mountain biking. It is also ideally located for exploring the beautiful Lake Como area and even into Switzerland and Saint Moritz. This most attractive site is popular with British and Dutch visitors, many having found it through Alan Rogers. The owners strive to maintain its tranquillity. The centrally located sanitary building contains modern showers (token), British style toilets and washbasins and is kept very clean. Excellent suite for disabled visitors. Washing machine. Swimming pool. Small playground. Bicycle hire. Fishing. Water-skiing. Canoe and pedalo hire. Free WiFi in reception area. Sorico is at the northern tip of Lake Como. Approach via the free SS36 dual carriageway from Lecco; just after end of motorway section turn east to Sorico. From Como the SS340 is narrow and winding. Site is on eastern edge of town and well signed.